Since the inception of the modern museum, parents have tried in vain to get their children to enjoy visiting them. Learning is never at the top of a child’s list of favorite things to do and they’d much rather play and have fun. 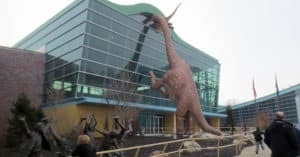 The Children’s Museum of Indianapolis aims to address this issue and effectively combines the excitement of play with in-depth learning experiences. If you’re making a trip to Indianapolis, this is a must-see attraction. Here are the top four things your kids will love at the Children’s Museum of Indianapolis. This attraction doesn’t really provide much in the way of learning experiences, but it can be a great ice-breaker to get your kids in the mood for the other cool exhibits at the museum. The area surrounding the chocolate slide is decked out in candy decor specifically designed to make your kids feel like they’ve stepped into Willy Wonka’s Chocolate Factory. While the slide isn’t actually made out of chocolate, little ones are able to enjoy a sweet treat at the end of their ride. Even if your child isn’t particularly interested in dinosaurs, you should still check this exhibit out. Chances are, they’ll change their mind after having close-up experiences with full-size dinosaur skeletons and digging for dinosaur bones. This exhibit features one of the largest known collections of dinosaur fossils on display. There’s even a chance to touch a real Tyrannosaurus rex bone! This exhibit is so much fun that your kids won’t even realize they’re learning until it’s too late. The best way to describe this exhibit is to ask you to imagine looking into a kaleidoscope. Now, imagine that kaleidoscope as an entire glass ceiling. Once again, imagine that enormous display extending upwards into the sky, as far as the eye can see. That’s the Fireworks of Glass exhibit. Made from more than 3,000 pieces of brightly colored glass, this sculpture rises over 42 feet into the air and is viewable from every angle. Once your kids are over the initial shock of this awe-inspiring sight, they can explore the world of glassblowing using virtual tutorials on the nearby computers. Again, they’ll be learning without knowing they’re learning. Don’t let the name fool you. Playscape may be all about letting little ones have fun, but there’s still plenty of learning to be done here, too. This exhibit is designed specifically for younger children, but it is very family friendly. Kids get to explore an underwater habitat, play with real musical instruments, and make their own makeshift clay. Be careful at this exhibit though. It’s very easy to get sucked into having hours of fun with your kids while the day slips away from you. Learning doesn’t have to be boring, and the Children’s Museum of Indianapolis does a great job at proving this fact. There are plenty of other exhibits to see besides the ones listed here, so head out and see what you and your kids can discover together.